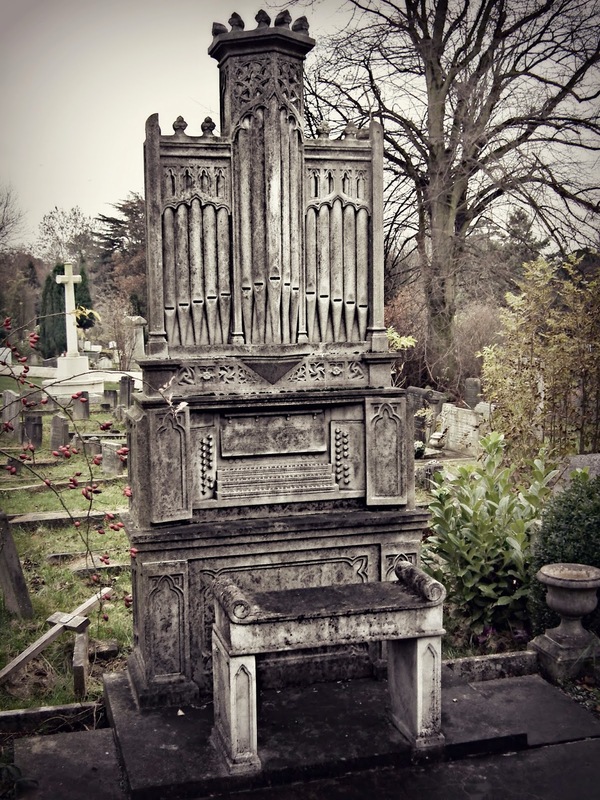 You might imagine that an funerary monument in the form of a life size pipe organ could only cover the grave of a church organist or a classical musician with a soft spot for Bach’s Toccata and Fugue in D minor. There is some evidence Charles Herbert Barritt (1869 – 1929, more generally known as Clifton Barritt) knew how to play a medley on the concertina but nothing to indicate that he was an organist. Clifton seems to have spent most of his life as a vaudevillian and music hall entertainer and his last years as a London publican. Mr Clifton Barritt, who has already, obtained honourable distinction in Manchester and other English cities as a musical and humorous entertainer, secured fresh laurels by his really able rendering of a number of songs and sketches written 'and composed by himself. He succeeded in keeping his audience convulsed with laughter from beginning to end. "A Penny Buys the Article" and "At the Pantomimes" were amongst his best performances. Mr. Barritt is quite a young man. and a short time will, no doubt, suffice to bring him into prominence as a successful and talented humourist. 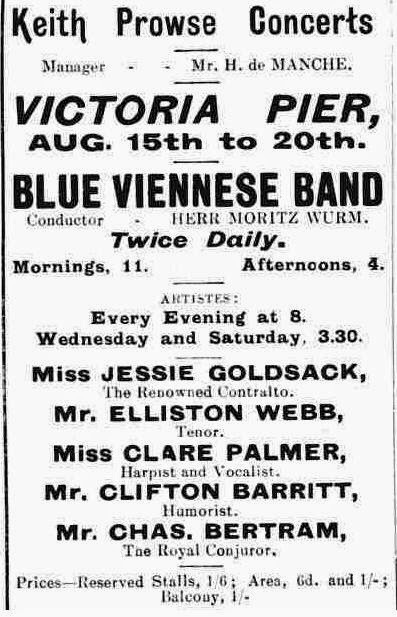 At Folkestone's Victoria Pier Clifton finds himself fifth on the bill to the Blue Viennese Band conducted by Herr Wurm, the renowned contralto Miss Jessie Goldsack, tenor Elliston Webb and harpist and vocalist Clare Palmer. Mr. Barritt was responsible for the comic element. He showed how songs of the ephemeral type could be arranged by Sousa, Mendelssohn, and Wagner but was at his best in his imitations. He successively imitated a rusty phonograph, a violoncello (using Elgar's "Saint d'Amour), a clarinet, banjo, and finally two instruments together, the mandolin and cornet (in "Whisper and I shall hear' ). Again he showed "The charge of the Light Brigade' could be recited by people afflicted with various eccentricities. has a fund of racy anecdotes, and is always "funny without being vulgar." This madcap eventually rejected his nomadic existence wandering the provinces of England and settled down. His eldest son Robert was born in 1900 and perhaps the presence of a child in his life made him decide to make Robert’s mother Hannah Harriet Law (known as Hattie according to the gravestone) an honest woman, though he took his time, not marrying her until 1906. The couple had two more children, Chilton and Constance, once Clifton had given up the stage. We know he was the publican of the Savoy Palace a pub in Savoy Street WC1 in 1911 because the whole family is on the census return for that year along with a potman, two barmaids and a children’s nurse. He went on to become the publican at the Blue Posts at the St Pancras end of Tottenham Court Road from 1915 until his death in 1929 when his wife Hannah took over the running of the business. Clifton died at the age of 60 on 21 July 1929 at 71 Ladbroke Grove, W11 leaving a not inconsiderable legacy of £11,631 3s 10d to Hannah. 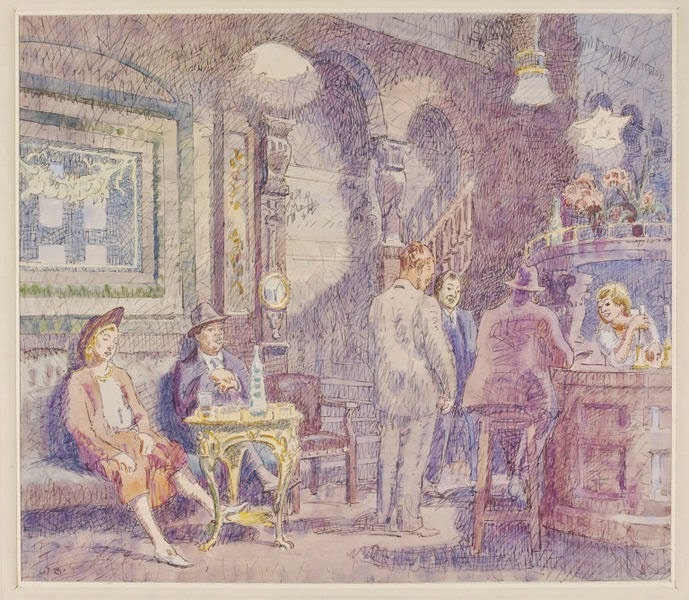 In the bar at the Blue Posts - 1940 by Bayes.